We’d love your help. Let us know what’s wrong with this preview of The Governess; or, The Little Female Academy by Sarah Fielding. To ask other readers questions about The Governess; or, The Little Female Academy, please sign up. I was unsure whether to give this book 3 or 4 stars as the characters were very well developed even though we had little information about them it gave you a sense of caring for the characters. 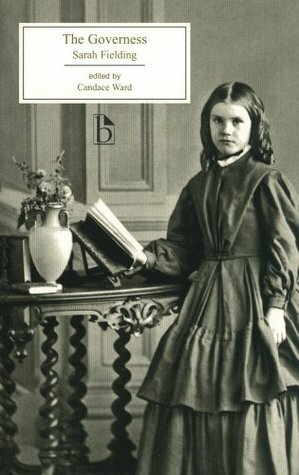 The story was made up of stories of nine children in which Fielding incorporated all their misgivings to establish a enviroment in which to teach the reader (namely children) morals and ideals of their attitudes in the world and what would make them happy. Fielding provides the enviroment of a school and I was unsure whether to give this book 3 or 4 stars as the characters were very well developed even though we had little information about them it gave you a sense of caring for the characters. The story was made up of stories of nine children in which Fielding incorporated all their misgivings to establish a enviroment in which to teach the reader (namely children) morals and ideals of their attitudes in the world and what would make them happy. Fielding provides the enviroment of a school and as it is deemed as the first novel for children we can see that over history not much has changed with sucessful children's novels like Harry Potter still exist today. This novel was a great start to the children's fictin course that I'm doing and really helped me understand the writers intention for children's fiction and the reasons for setting. I had to read this for my eighteenth century lit class last semester. This book is considered one of the first novels written specifically for children, and it is fascinating in how different it is from the children's books we read today. It is incredibly didactic, but quite entertaining in its own right. The book reflects many of Locke's viewpoints on the education of children. Sarah, younger sister of Henry Fielding, wrote the first English novel intended explicitly for children. She and Henry lived together and made their living writing until he married and resumed practicing law to provide for his children. There is some thought that the siblings may have sometimes written bits of one another's books. She was also a biographer, critic, and translator. Like a combination of Canterbury Tales and A Little Princess, but boring. I would have rather just had the stories without the unnecessary framing device to make sure the readers understand the subtext. Especially disappointed considering the book started with a fist fight. I didn’t like it, I found it flat and boring. It’s classed as a children’s book from the past, so it’s very different to the books made for children now. But it does have morals for the story. But the characters were well developed, there wasn’t too much detail about each one but you can tell their reasonings for their actions. I’m not likely to pick this up ever again and this is one I had to due to it being on my children’s lit reading list. this wasn't a very good book and i didn't enjoy it at all! it's pretty cool that it was the first ever book written for children but i'm glad children's books and school stories have come a long way since then. Imagine having nothing but this and the Bible to read. Absolutely excruciating. I thoroughly enjoyed this book but am used to reading novels from the late 1800s and early 1900s. I imagine it would be far too overtly moralistic for the average twenty-first century reader. Although this is a children's book, I would not recommend it for children today. Still very moralistic in tone, the Governess does manage to tell the realistic story of a group of young girls, each with their own faults, trying to be better. The fairytales that are used to instruct them were quite interesting from a gender point of view, as well as simply quite entertaining. It was neither here nor there, a charming morality tale. Obviously heavy-handed; what else would you expect of a novel that was meant to instruct its readers? For all that, it's cute enough to be worth a browse. An interesting look at what was thought to be suitable literature for children in the 18th century. More moralistic than entertaining, this is more of a lesson in historical gender ideals than book for entertainment. Very moral based and at times hard to read but once you get past that it's actually a decent book. This book, in all its 130-page glory, is pure torture. I can't force myself to finish it. I'm a disgrace. Sarah Fielding was a British author and sister of the novelist Henry Fielding. She was the author of The Governess, or The Little Female Academy (1749), which was the first novel in English written especially for children (children's literature), and had earlier achieved success with her novel The Adventures of David Simple (1744).